Hi, If you would like to comment on any of my liveries, please add your comments to our guest book. To view my customer comments on simmarket, click here. I\'ve purchased liveries from Blackrose Livery Design and must say that the liveries where top quality.I can only recommend Blackrose Livery Design! I bought two liveries for PMDG 737-700 and i must say that i am very very satisfied!!!! Colours are brights, the design is excellent and i got it in only few days, both in 32bit or in DXT3 textures! Wow...it is wonderful to have your preferred aircraft in the paint scheme you always desired... fantastic! And, believe folks, the price is RIGHT!!! Excellent opera, Andrew.... thank you! Excellent, Excellent job that BLACKROSE-LIVERY DESIGN does. I am very please with the livery that they done for me. The turn around is great. I had it done in just two days and the way I wanted done. If you are looking for a certain livery, I highly reconmend these guys. You won\'t be dissapointed. I\'ve asked (Andrew) Blackrose to design a special livery for the Wilco A318, based on the Italian singer Laura Pausini and her world tour 2009. He did an excellent job in creating exactly the livery I had in mind. I would say he\'s not just a painter but a real artist. If you buy services from Blackrose, you will definitely not be disappointed in the quality of the end-product (whatever your request). Furthermore this service is very reasonable priced. I highly recommend Blackrose if you want to fly around the virtual skies in your own personalized aircraft. Please post a comment/review on this page by clicking the link opposite. Comment: I can confirm the good quality! If you are looking for the perfect livery, then the sarch ends here. Reliable, secure payment and fast delivery via E-mail. Very good service! Comment: I purchased five liveries of at blackrose and I\'m very happy of the work of Andrew Tyler. Congratulations, liveries are incredible !!! Comment: Very impressive work done here. Andrew has made us a couple of liveries now for Air Anatolia and we are very impressed with the quality of the work that he does. Thanks Andrew! Comment: Excerllent job done. Quick at replying to email\'s. High quality finish and almost exactly to the way i wanted. If you need a repaint i suggest you get it done here! Comment: He does great work. He has done all my Oasis Hong Kong repaints. Outstanding!!!!! Just waiting for his Internet to get back up to get my other repaints still pending. Comment: This shop really fills up a gap in the internet flight-sim-community. Nowhere else you can get liveries like these ones. Beside and considering this nowhere else you can order liveries. Even the most difficult repaints you\'ll get in such an overwhelming quality that you\'ll believe that you just installed a brand new plane. This is an absolute perfect service. Thanks for that! Comment: The PMDG 737 NGX repaint Andrew created for me is accurate and what I expected. He got it right the first time. I recommend FS-Repaints.co.uk to anyone who wants a quality flight sim repaint. Comment: I made a very challenger request to Andrew, a Airbus A320 F-lite from Justflight in an brazilian airline called TAM colors, it was a very hard job once justflight do not provide the night textures kit. Andrew has surprised me with an OUTSTANDING paint job so beautiful shows in my FSX, I would like to thanky you Andrew for this great add on for my fleet, keep making that good work for the FS comunity, best regards. Comment: A great Hangar with great service. Andrew provides us with great liveries with outstanding precision. I really recommend Andrew if you wish a repaint. Comment: Andrew has such an eye for detail, he beautifully painted for me an Air Italy 757-200 for the Captain Sim model and what can I say it is superb quality. Really couldn\'t have asked for more and thoroughly recommended! Comment: Andrew Always does a Fantastic Job, I Highly Recommend Him to anyone looking for a Special Livery, Well worth the Money. Thanks Again !!!!!!! Comment: Thank you Andrew that Flybe E170 was just what I was looking for. Anyone looking for repaints they can\'t find anywhere else it\'s worth buying from here. IMPORTANT - PLEASE READ: Please note that each price quoted in the livery shop applies to ONE repaint only. Additional repaints require an additional purchase. This also applies to requesting a new repaint, each request applies to ONE repaint. Payment for liveries in the catalogue is via PAYPAL. Please specify FS2004 or FSX. NO REFUNDS CAN BE ISSUED AFTER A DONWLOAD LINK HAS BEEN SENT. All liveries purchased through the livery shop will be delivered within 24 hours of purchase - please note this does not apply to requested liveries as these will take more time to prepare. Please also note that the painting of new liveries using our Livery Request form can take some time to produce, the length of time taken will obviously depend on the amount of detail to paint - customers will be kept up to date with the progress. Please do NOT share liveries purchased from this site with anyone else, liveries are for the sole use of the customer only. 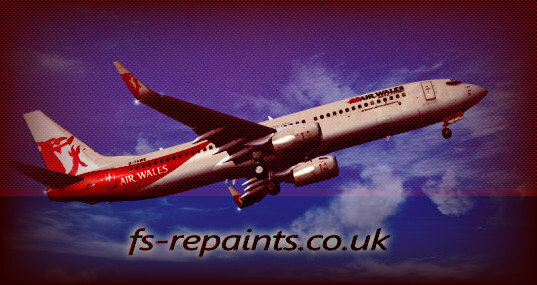 Liveries purchased through our catalogue can also be modified to include a different registration number or level of dirt required - if any modifications are required please e-mail enquiries@fs-repaints.co.uk.